Magneto-Optical Kerr Effect (MOKE) is a powerful technique that enables to study the magnetic properties of samples by using polarized light. When a beam of linearly polarized light impinges on a magnetic sample, its polarization is modified and the beam becomes elliptical, with a rotation of the major axis proportional to the sample’s magnetization vector (M). From the analysis of helicity and rotation versus the external magnetic field (H), it is possible obtain the magnetization curve of the sample (M vs H). H and M can be applied and measured, respectively, along different directions (e.g. in-plane and out-of-plane), thus allowing for a full 3D magnetic characterization of thin films. Using a microscope objective as illustrated in Figure 1, the laser spot on the sample surface can be reduce to a diameter in the order of 10 µm, thus allowing for magnetic characterization with spatial resolution, especially useful for the characterization of patterned samples and/or devices. Two representative examples are shown in Figure 2. Figure 1. Experimental setup for µ-MOKE. 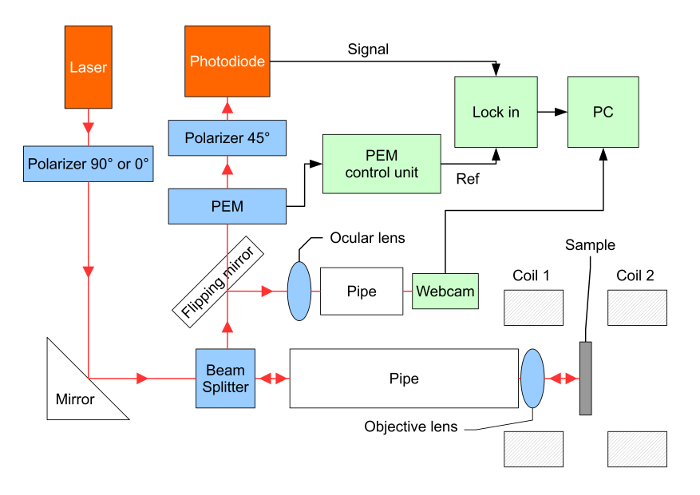 A webcam permits to view the position of the laser spot on top of patterned samples. Figure 2. µ-MOKE can be successfully employed to measure the magneto-electric coupling between ferroelectric and ferromagnetic materials in micro-capacitors (a) or to study the magnetic properties of spin-photodiodes (b). Polar (out-of-plane magnetization) and longitudinal (in-plane magnetization) configurations can be used. Beam dimension at the sample surface: d~ 10-30 µm. Sample dimension. there’s no particular restriction. We usually investigate 10×10 mm2 samples, but bigger samples can be investigated. Laser sources. Typ. a thermally stabilized laser diode, λ ~ 635-670 nm, P< 10 mW. Alternatives: 831 nm, 1310 nm, 1550 nm.